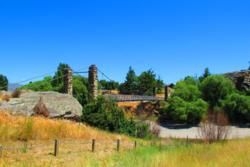 35km south of Cromwell, Alexandra is another reminder of Otago's gold mining past. Founded during the 1860s gold rush, the settlement was previously known as "Lower Dunstan", "Manuherikia" and "The Junction", before a permanent name change in honour of Princess Alexandra of Denmark, wife of the future King Edward VII. The extreme climate here – very hot, dry summers and cold winters, mean the area is perfect for growing fruit, although many orchards and vineyards were destroyed during construction of the Clyde Dam in the 1980s. Undeterred, the town clawed itself back, and regained its status as one of the area's primary centres of stone-fruit production. The world's most southerly vineyard, Black Ridge, is in Alexandra, and New Zealand's biggest Blossom Festival is held here every September, celebrating the arrival of Spring – the most important time of year for the orchard farmers. Today, the festival includes not just symbolic ceremonies and thanksgiving, but a myriad events including live music, activities, floats and even a fashion show. But there's more to Alexandra than grapes and orchards. 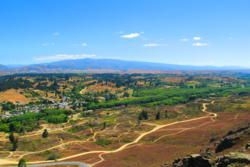 One of the region's most visited attractions, the 150km long Otago Central Rail Trail, passes through Alexandra, which is the second stop on the trail, after Clyde. The railway began construction during the gold rush era, to facilitate travel between the lucrative goldfields but, ironically, when the track eventually reached its northern destinations of Clyde and Cromwell, in the early 20th century, the 'rush' was all but over. The railway remained a working concern for a few more decades, transporting cattle and goods across the region, but is now a publicly-owned reserve and tourist trail, with hundreds of thousands of walkers, cyclists and riders trekking along the route every year, taking advantage of this unique landscape. For a bigger insight into Alexandra's fascinating history and gold rush heritage, visit the Central Stories Museum and Art Gallery on Centennial Avenue, which also houses an i-Site information centre. For those wishing to spend a few days in Alexandra, there are plenty of accommodation options, from smart hotels, to cheaper motels, B&Bs and homestays. There's good shopping to be had, around Ennis Street, Centennial Avenue and Tarbert Street, the latter being where you'll also find some of Alexandra's oldest buildings. There are lots of good restaurants and plenty of bars, here, too, with wine, obviously, figuring highly on the list of top tipples. During your vist, also look out for the landmark clock, high above the town with its huge clockface, making sure no-one in town forgets the time.